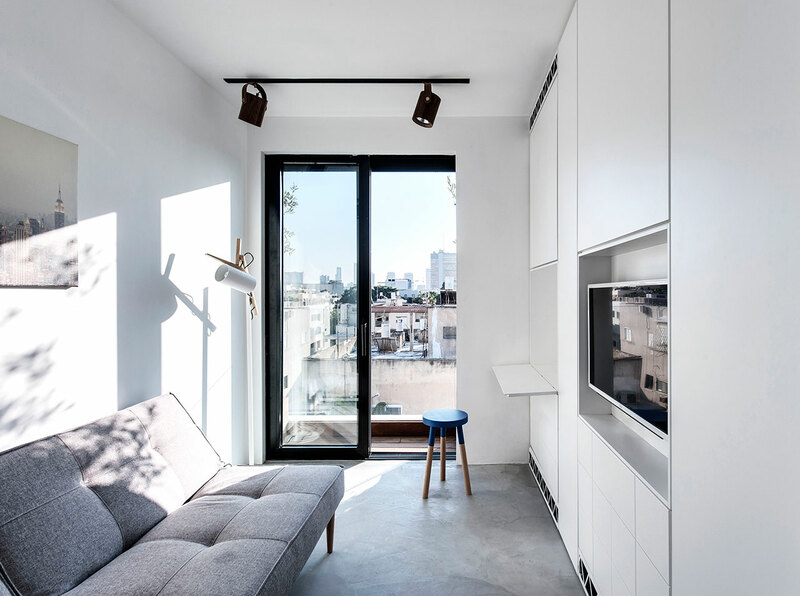 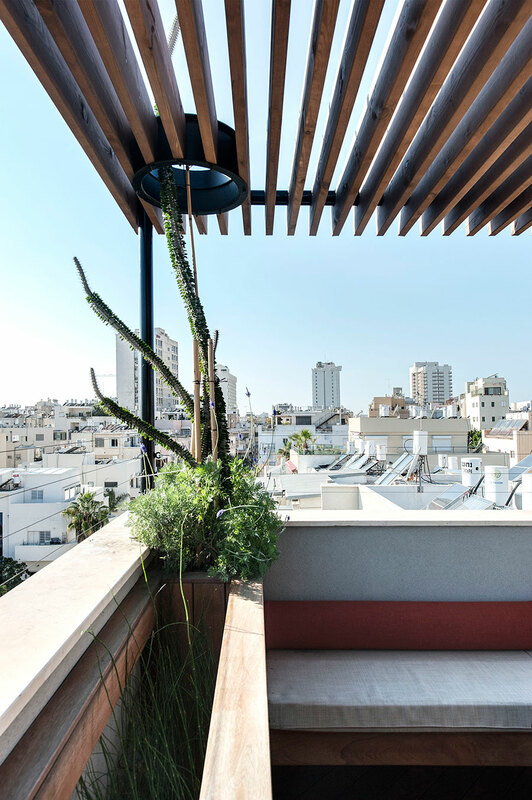 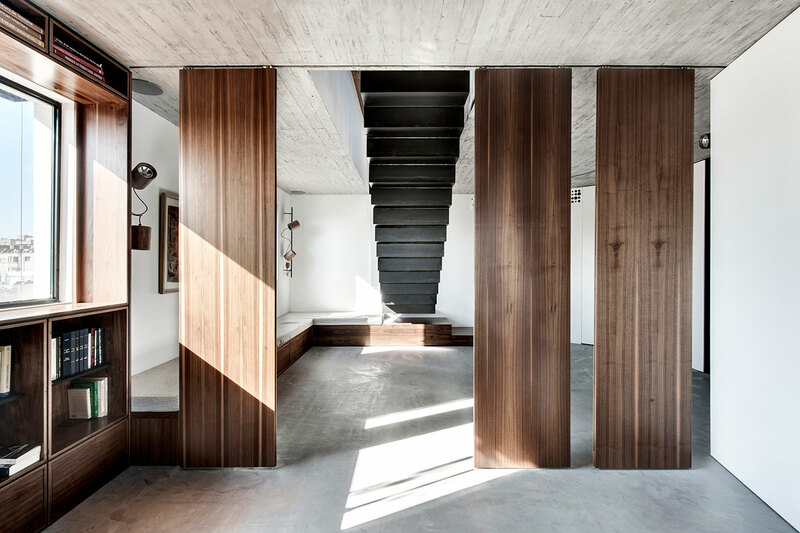 Designed by locally based architects, Toledano + Architects, this 160-square metre, stunning duplex penthouse apartment and surrounding 80-square metre timber-clad roof terrace renovation in Tel Aviv, Israel, provides a light-filled contemporary home for a design-savvy young family. 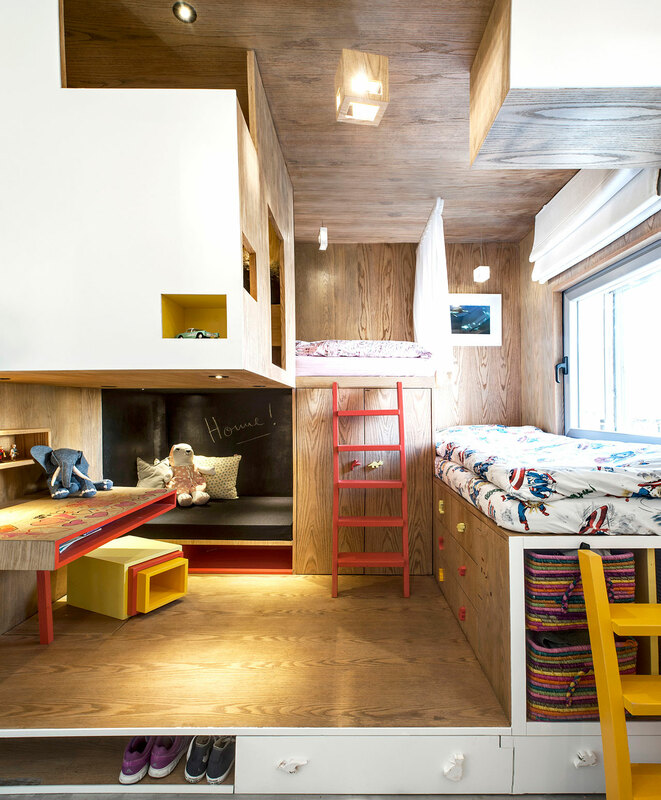 According to Gabrielle Toledano of Toledano + Architects, “The main challenge was to combine privacy between quiet parents’ and children areas, and big spacious and modular living spaces that would encourage get-togethers and would play with the powerful Middle-Eastern light.” This challenge was resolved in the clever planning of the space: the lower level sees the parent’s and children’s zones separated by a centralised modular and flexible living space that sits between them. 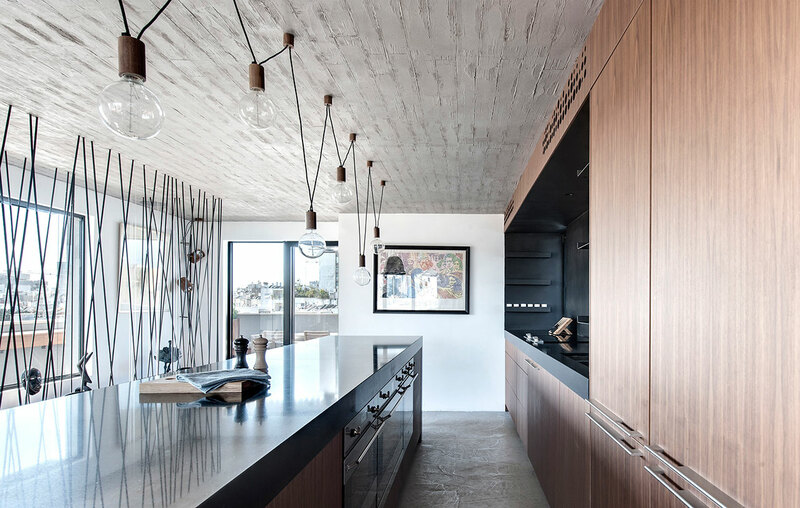 On the upper level, the large kitchen, lounge and enveloping roof terrace blend into each other thereby creating a seamless articulation of the idea of erasing the boundaries of internal and external space. 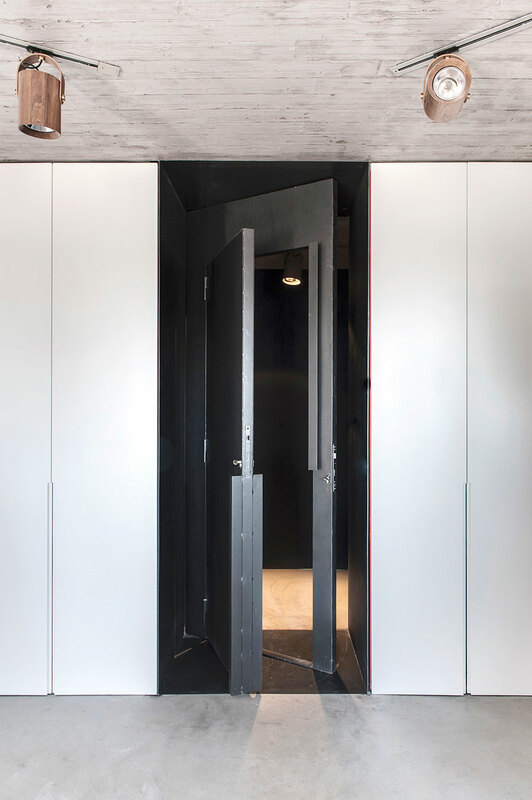 The family wanted a ‘chic yet playful’ space to cater to all; as such, the children’s rooms are designed to encourage play, imagination, learning and creativity with blackboards, integrated desks, laser cut maps and even a dance bar! 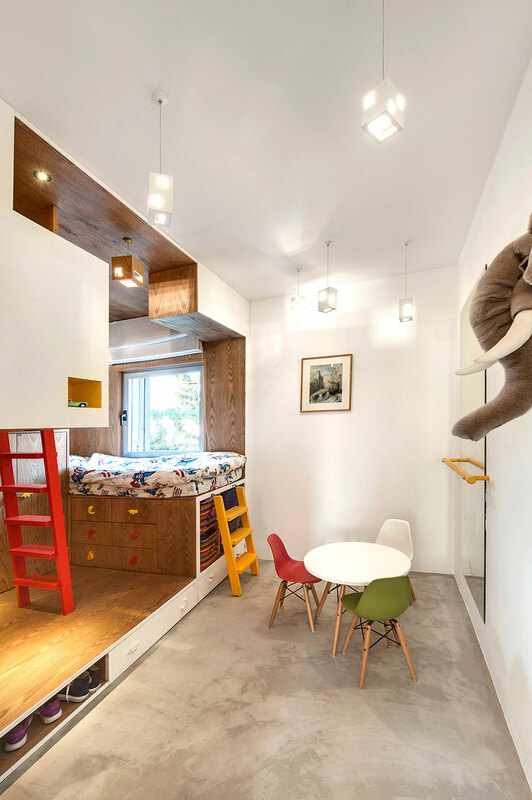 Beautifully lined in timber, these indoor spaces are the children’s own internalized tree house playgrounds. 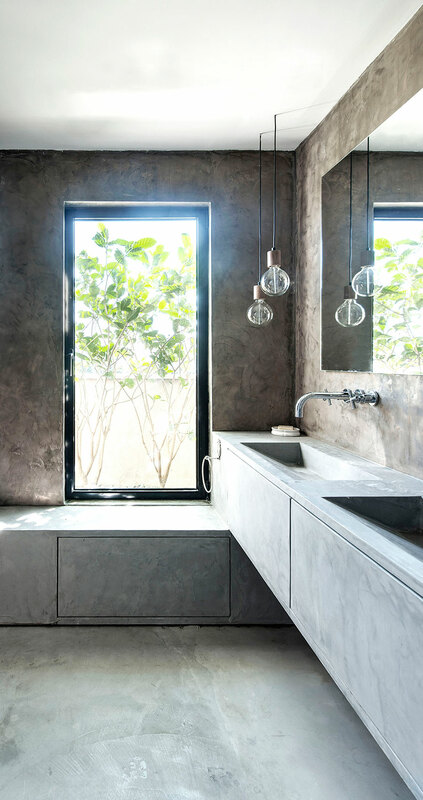 By contrast, the master suite on the other side of the home uses its own design language and provides a sanctuary with a minimalist aesthetic of crisp white finishes and a concrete-lined bathroom. 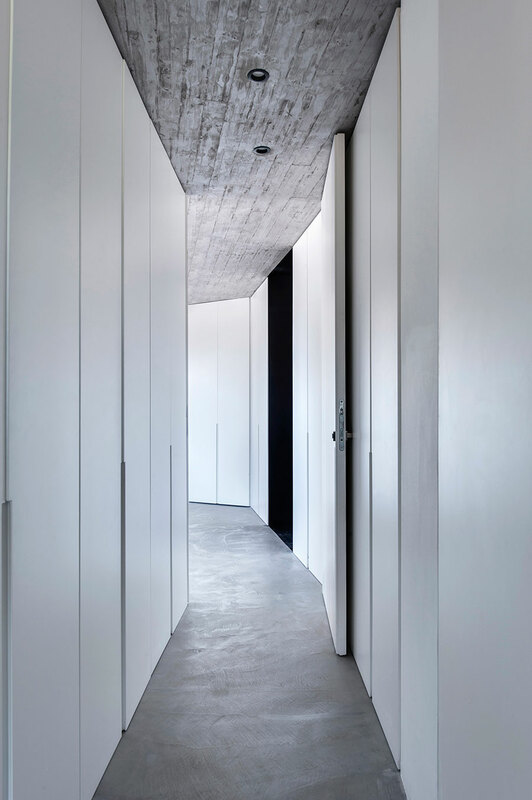 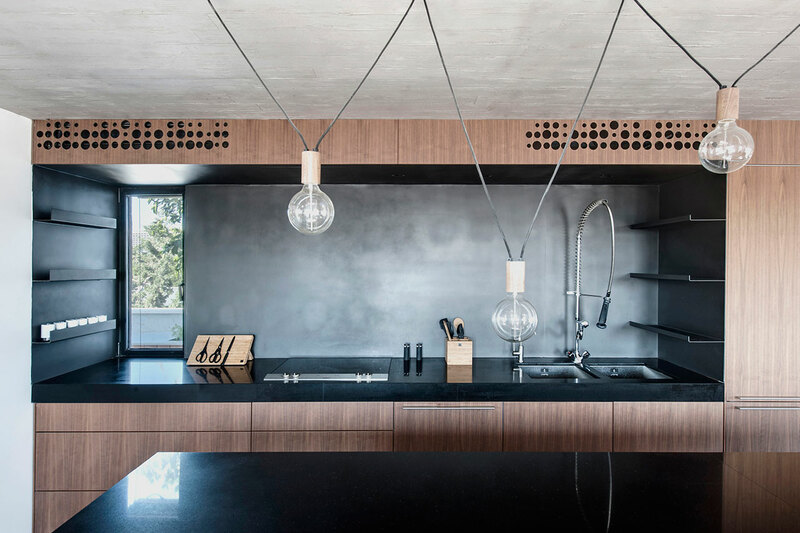 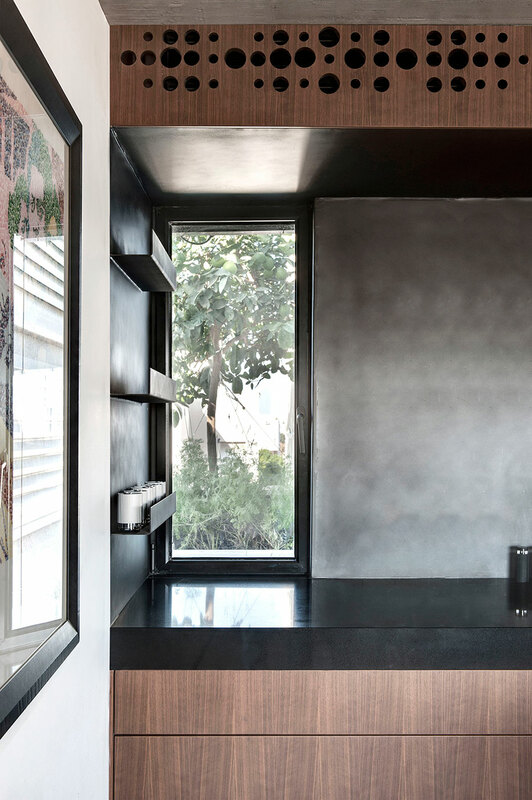 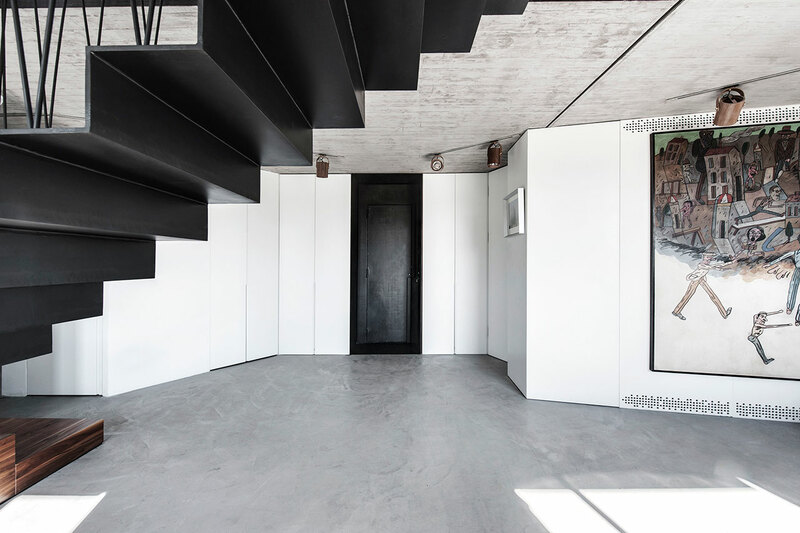 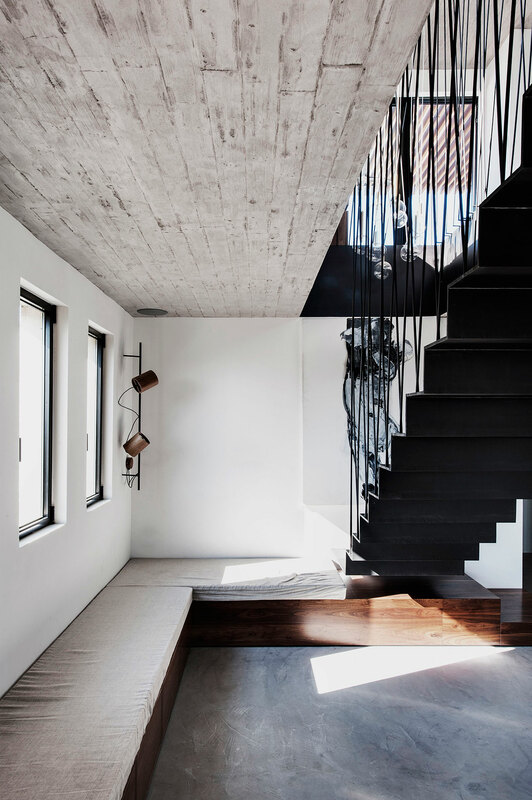 In the common areas, a beautifully complementary material palette of walnut timber, honed and raw concrete and black steel create a contemporary, contrasting and warm space, with the visible lines and textures of the concrete formwork adding a richness and depth to the finish. 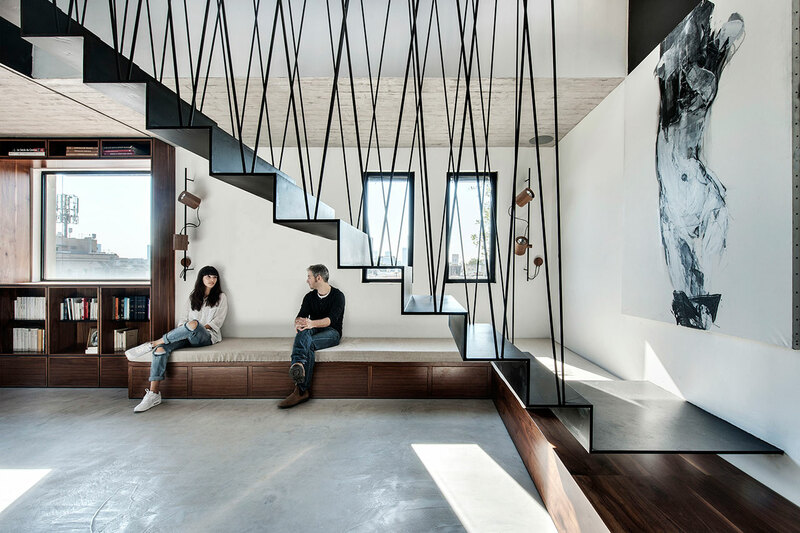 Meanwhile, the suspended folded black metal stair becomes a graphic and sculptural articulation through the salon space, as dramatic shadows are created through the crossed metal strings by the shifting natural light. 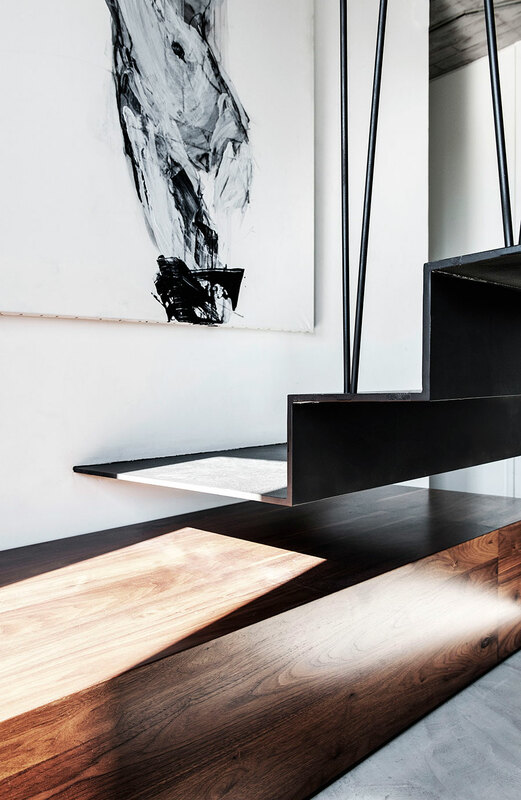 The space’s overall style is complemented by the family’s art collection, coupled with integrated design elements such as the custom timber light fittings, the selection of which brings a cohesive and distinct character to the whole project. 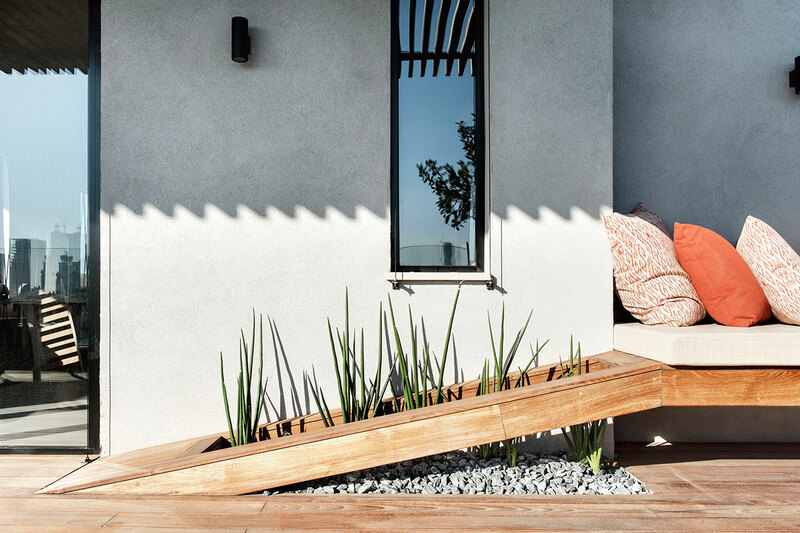 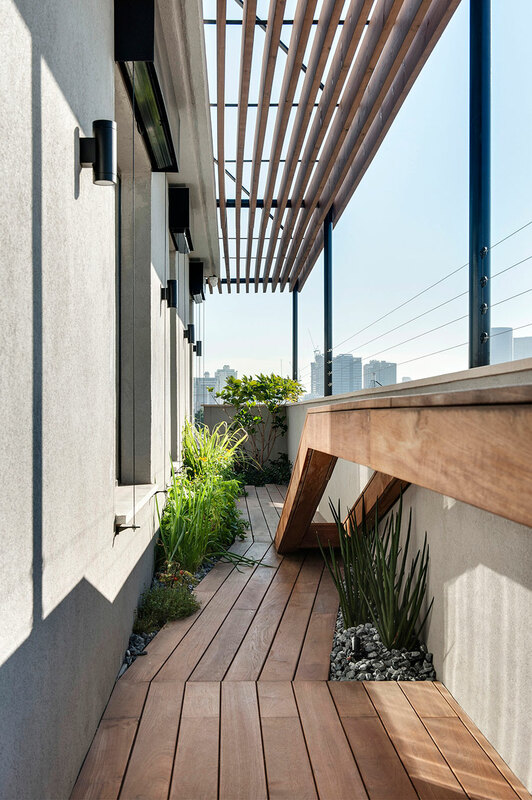 On the roof terrace, teak timber was used to create continuous folding lines to form benches, seats and planters allowing for plants to be seamlessly integrated into the design. 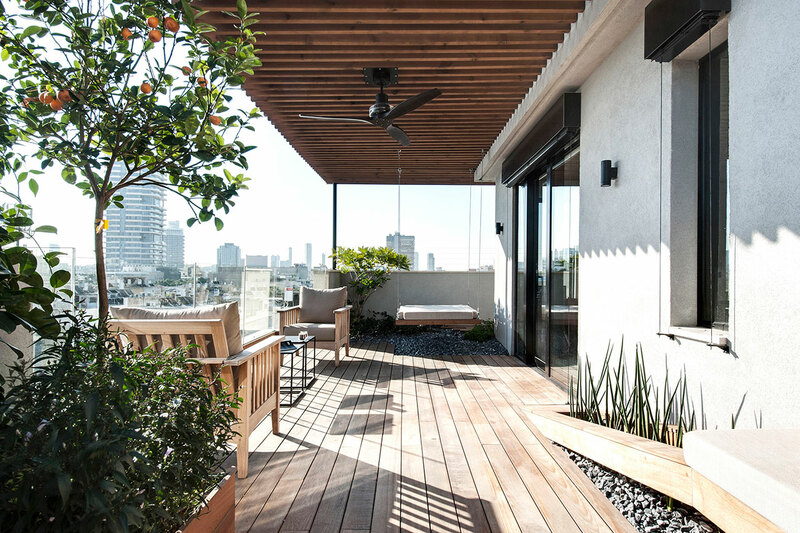 An outdoor kitchen and the addition of an oversized swing seat make this a wonderful space for a young family to relax and enjoy the views of the Tel Aviv skyline, framed by the canopy of an elegant teak pergola.